Named after the black band of feathers under their chin, chinstrap penguins are probably the most abundant penguin in the Antarctic regions, with an estimated population of nearly eight million pairs, concentrated on the Antarctic Peninsula. 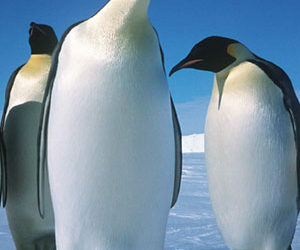 In the world of penguins, chinstraps live in some of the largest cities, with colonies of over 100,000 pairs on some islands. Living mainly on a diet of crustaceans (they can dive up to 70 metres but catch most of their food in half-minute dives in the top 10 metres of the sea), chinstraps stick close to their breeding grounds. Unusually, they often dive at night. 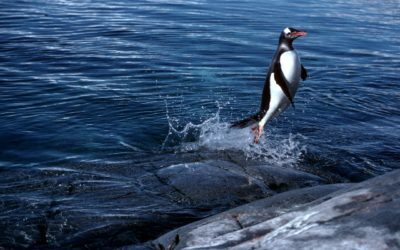 They nest on ice-free slopes with thousands of breeding pairs, sometimes with their closest relatives, Adélie and gentoo penguins. The highest slopes are the most popular (they become ice-free first) and they use their beak and claws to reach seemingly improbable spots. They form a strong pair bond, returning each year to the same nest site with the same partner. Because of their warmer breeding location, chinstraps enjoy a longer breeding season than the Adélie. They lay their eggs late in November, which hatch in early January. The chicks have usually fledged two months later. The two chicks are treated equally by the parents, but breeding success is severely reduced if the sea-ice does not break away from near their colonies.